Commercial Property Pest Inspection: How Can You Save Money? Commercial Property Inspection: Why Is It Important? When it comes to commercial pest inspection, most of the people usually don’t give it a single thought unless and until they see that the premises are completely destroyed. They will either notice in the ceiling or probably in the roof void or there might be any other kind of damage in the woodwork which is done by the termites. This is one of the major reasons why you should speak with the local pest control company who specializes in commercial property pest inspection. They can help you get rid of the pests easily. Why do commercial property owners take so much time to hire the pest control experts? Either the reason is because the pest control experts charge a lot of price or because they want to take a DIY approach. It is always advisable to go for the pest inspection once a year. You can also do it every six months, especially if there are too many termites in your neighborhood. This will worth your money. Of course, commercial pest inspection is going to be a little different. It will be require a number of visits. 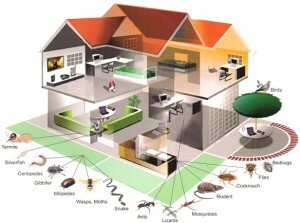 Therefore, you should speak to the pest technician to get a free advice. Once the process of pest inspection is done, the next step is to go through the report which has all the essential details. From the interior areas to the exterior part of your home, you can learn about different aspects of the property. You should seek advice from the pest control manager especially when there are fleas or bed bugs in your home. By getting the right assistance in dealing with the pests, you can quickly get rid of them. Keep all these excellent tips in mind for commercial property pest inspection.